Measure your horse then buy a saddle that fits! Properly fitting saddles is Crest Ridge Saddlery’s first objective! 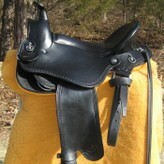 Crest Ridge Saddlery offers nine different saddle styles built in a variety of weights. We offer seat sizes from 13" to 18" (13", 14", and 18" seats are special orders which may take longer to produce and are not available in all styles). With 19 saddle trees in our active inventory, Crest Ridge Saddlery can provide a saddle that best fits you, your horse or mule. We assist your selection process by identifying which saddles will best fit you horse using measurements and photographs you take using our easy to follow saddle fitting system on our “How to Measure” page. Our saddle fitting system works on all types of horses and mules including stock horses, gaited horses, draft horses and mules. Our system even works for zorses! Our goal is to sell you a proper fitting saddle for your horse that improves your horse’s gait, your safety and your enjoyment. All Crest Ridge saddles are designed to place the rider in a center balanced riding position, for optimal safety and comfort. Our saddles are designed to reduce their weight by using shorter rounded skirts. Our saddles accommodate the shorter backs found in many gaited breeds and feature flared trees to avoid interfering with the horses shoulder. All of our saddles are built with high quality materials by some of the finest Amish leather craftsman in the country. Crest Ridge saddles are built to last by using top quality materials and attention to detail in both design and construction. Our Amish master craftsman can build a custom saddle for you--if you can dream it, we can build it. We stand behind our service, saddle fitting, materials and craftsmanship by guaranteeing your satisfaction. If within seven days, or longer with our agreement, the saddle is not right for any reason, send it back for an exchange or a full refund, less shipping. If you have more questions, call us at 417-644-0091 or send an e-mail to saddles@crestridgesaddlery.com. 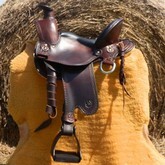 Saddles pictured may include optional equipment that is available at additional cost. 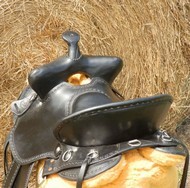 Trail horse saddles are the most popular style of gaited horse saddle in the United States. 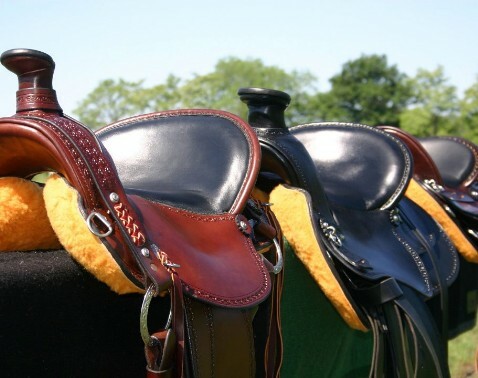 Crest Ridge Saddlery offers five different trail horse saddles. Each is uniquely designed to match needs of the horse and rider. Our trail saddles are also available in Ultra-Lite and Lite models, where we substitute Codura for leather and/or use lighter weight trees to reduce the total weight to as little as 14 pounds as compared to around 25 pounds for our traditional leather saddles. Our Heritage Saddles are modern renditions of classic saddle concepts adapted to the demanding requirements of gaited horses and mules. We took proven ideas such as McClellan rigging, bear trap swells, California fenders, 3/4 seats, over the tree rigging and many others, to create these saddles. Most of these saddles began as a custom order by one of our customers who had seen a saddle in a museum and wanted one for themselves. Each is a work of art made by our Amish master craftsman. All our Heritage Saddles are completely functional and rugged enough for everyday use. Many avid riders have the ideal saddle pictured in their mind but can't find exactly what they want. Crest Ridge Saddlery can finally make that dreamed for saddle a reality by building a custom saddle and tack for your horse or mule. You don't have to compromise your desires, nor do we compromise on quality. Best of all, you'll be pleasantly surprised how affordable it is to have your custom horse or mule saddle built by Crest Ridge Saddlery. The pictures to the right are just a few examples of what we have built in the past. Click here to learn more about our process for building you a custom saddle that fits. 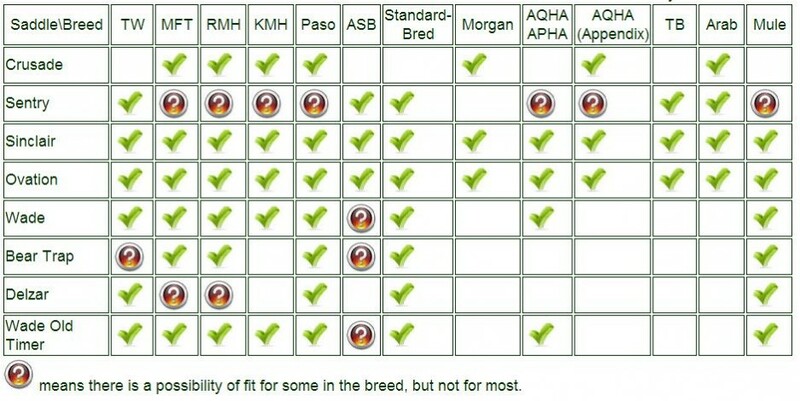 Which saddles are most likely to fit my breed of horse? A check mark indicates we've had success with that breed/saddle combination. We still need to fit your horse.